painted during the third voyage while surveying Australia. HMS Beagle was the ship that sailed around the world with the young naturalist by the name of Charles Darwin on board. The ship was sold for scrap in 1870 but until now it´s final fate has remained one of the world´s great naval mysteries. A discovery has been made by Robert Prescott of St Andrews University, who is one of the world´s leading marine archaeologists. He says that he is quietly confident that the final resting place is near Potton Island in Essex, UK. Geophysical techniques and an advanced ground-penetrating radar located a buried structure which matches the size and shape of the Beagle. Techniques used to see if the timbers are from the Beagle include testing the ship´s bilges for remains of tiny marine organisms called diatoms. Certain species of diatom are found in specific areas of the world so they are hoping to find diatoms unique to the Pacific or Australian waters. So far the results have been very positive but for incontrovertible proof one well recognized tropical diatom must be found. HMS Beagle was one of the commonest classes of warships built by the Royal Navy. 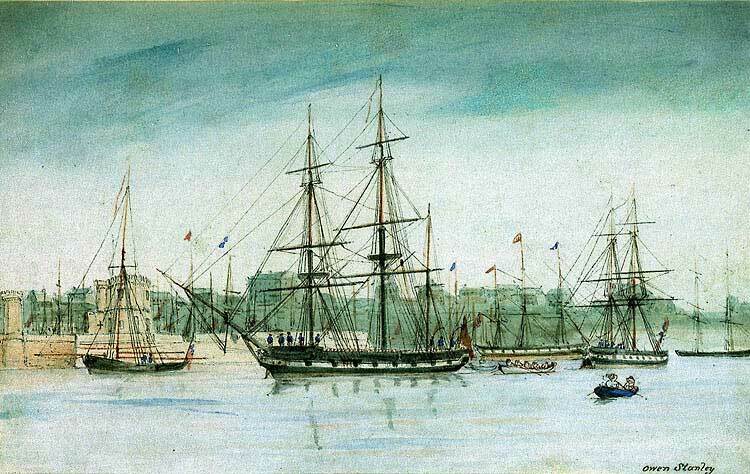 The 90ft, 10-gun brig was launched in 1820 at Woolwich Royal Dockyard on the Thames. It was later refitted as a hydrographic survey vessel and set off on its great journey with Darwin as a passenger in 1831. For five years it carried out detailed surveying of the tip of South America and in the Galapagos Islands. Darwin suffered terribly from seasickness and apparently spent most of his time in his hammock while at sea. It was remarked that it was almost unheard of for a passenger to suffer from seasickness from start to finish of a five year long voyage! The voyage was to be, however, the most important event in Darwin´s life. He observed the local variations among the birds and animals he found and it is from his cabin on the Beagle that he developed his theory of natural selection. These discoveries were consequently published in his book, ´On the Origin of Species´, in 1859. His book introduced the scientific theory that populations evolve over generations through a process of natural selection. He said that animals live longer when best adapted to their environments and produce more offspring and therefore species slowly evolve. His theory of evolution certainly caused an outcry at the time! After the Beagle returned from its infamous journey it was used as an anti-smuggling patrol vessel along the Essex Coast. Further investigation by Prescott uncovered that the Beagle was moored mid-stream on the River Roach where it could intercept smugglers. It was not a popular permanent fixture as it was claimed it harmed the oyster beds. Final records from 1870 show that it was auctioned for £525 to local scrap merchants, Murray and Trainer. A small dock on the north bank of the River Roach has been the focus of the team from St Andrews and this is where they think it was left after it was stripped. Prescott says that the discovery is of great importance. "Most of the upper part of the ship may have gone, but we have the lower parts and hull, and who knows what remnants of Darwin´s trip may still lie down there". We shall have to wait and see.